The dream was inspired by the 1987 World Solar Challenge. It began with the plan to build a solar car to compete at the prestigious World Solar Challenge. Years later, it evolved from entering the solar car race to take on the greatest challenge on the planet for a solar car, the Arctic circle and deliver on a promise to set the world distance record. On June 12th 2008 the epic journey began with a symbolic start in Toronto, Ontario, Canada at Seneca College, one of the projects greatest supporters. The actual drive began in Buffalo, NY, USA. As solar cars were forbidden to drive on Ontario public roads at the time. On July 27, 46 days later, XOF1 became the first electric vehicle and first solar car to reach the Arctic. It was then driven around Alaska, crossing the top of the world highway. At mile "zero" in Victoria, BC, Canada. XOF1 broke the previous world distance record of 15,070km. Mission accomplished! delivered on all it's promises. However, the drive didn't stop there. The never ending solar car tour continues. XOF1 was then driven to Los Angeles where is received the red carpet treatment at the Canadian Consulate with a warm welcome from Hollywood movie stars and international press. It was driven to the boarder with Mexico, crossed east and south to Key West, FL, USA. Went North to Washington and Baltimore before turning north west arctic bound for a second time. On April 10th 2010, XOF1's wheels rolled on the frozen Mackenzie river reaching the remote hamlet of Tuktoyaktuk nine and half hours later. 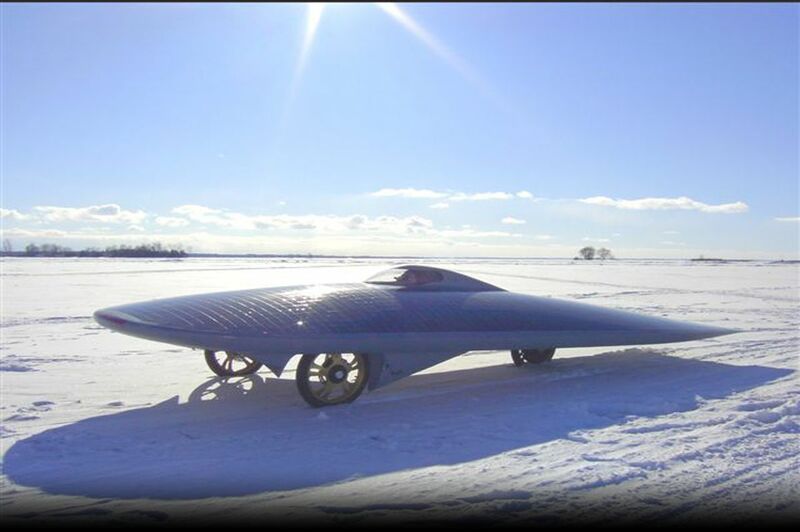 XOF1 became the first electric vehicle and first solar car to cross the longest ice road in the world. Two and half days later the team was pushing the limits of man and machine on a second unscheduled drive over the longest ice road on the planet. It successfully completed the journey! XOF1 was never plugged into the grid, it crossed the continental divide 16 times, traveled over 3,000km (1,800 miles) on gravel roads, taken on snow, ice, the low angle sun of the Northern hemisphere during the wettest summer of the past 30 years, and conquering the infamous Dempster Highway at its worst since it was built 40 years ago. Along the way, people and communities graciously opened their homes and made welcome the solar car, driver, and volunteers who joined the project. Their support and generosity made it possible for XOF1 surpass it’s goals without sponsorship or benefactors. On April 2011,Xof1 was pulled by hand, 160km from Niagara Falls to Toronto to inspire positive changes. From May 1st to May 28th, XOF1 will be pulled by hand 475km (295 miles), a 28 days journey zigzagging between communities from Toronto to Ottawa from Toronto to Ottawa to Challenge everyone to change something, anything to help the environment for 28 days. XOF1 and it's team continue its work to inspire with presentations at schools, universities, conferences and private and public events.